Opened on August 1, 1928, the Detroit Zoo is the single largest paid family attraction in Michigan. Run by the Detroit Zoological Society, a non-profit organization with more than 56,000 member households, the Zoo attracts more than 1.4 million visitors a year, is situated on 125 acres with naturalistic habitats and provides a home to more than 2,400 animals of 255 species. 2016 saw the Zoo open the Polk Penguin Conservation Center, the largest facility dedicated to the study and protection of penguins in the world. It’s really user-friendly and the UI makes managing email signatures so easy. More and more organizations worldwide are migrating to the Cloud, a simple fact that is changing the way the IT industry operates. The move away from on-premises hardware has not meant that organizations no longer have a need for email signature management solutions. If anything, the need for such products has actually increased due to the rapid adoption of services like Office 365. 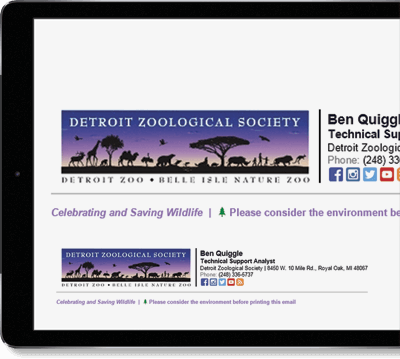 The Detroit Zoo had been using various versions of Exclaimer’s Exchange signature software since 2007. Having moved to Office 365, it wanted to keep the same email signature management benefits that it had been used to such as ensuring end users were unable to modify signature templates, having a consistent design for all and easily be able to make updates as and when required. This meant that on-premises email signature software was no longer of use to the Zoo. A cloud-based solution was now the order of the day.